Taylor Peak reflects in The Loch on a georgeous morning in Glacier Gorge. The Loch gets its name from an early Scotish vistor to the area who spent the night in Glacier Gorge waiting out a heavy snowstorm. 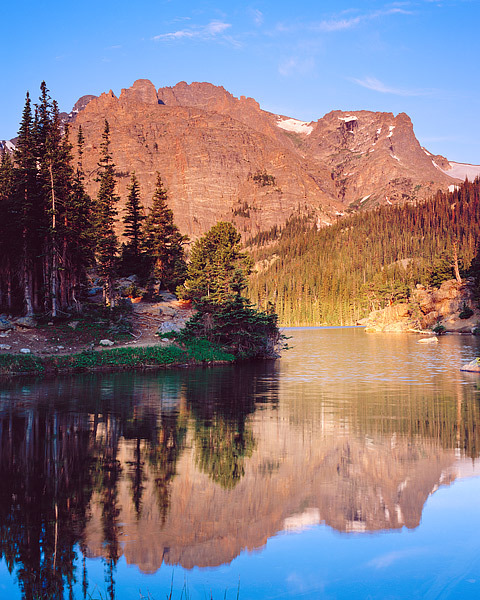 Glacier Gorge and the Loch is one of Rocky Mountain National Park's most popular hiking destination and is a must see for any Colorado visitor. Photo © copyright by Thomas Mangan.